HaNoi T&T extended their unbeaten run in all competitions to 6 games with a club record 7-0 win over Dong Thap. 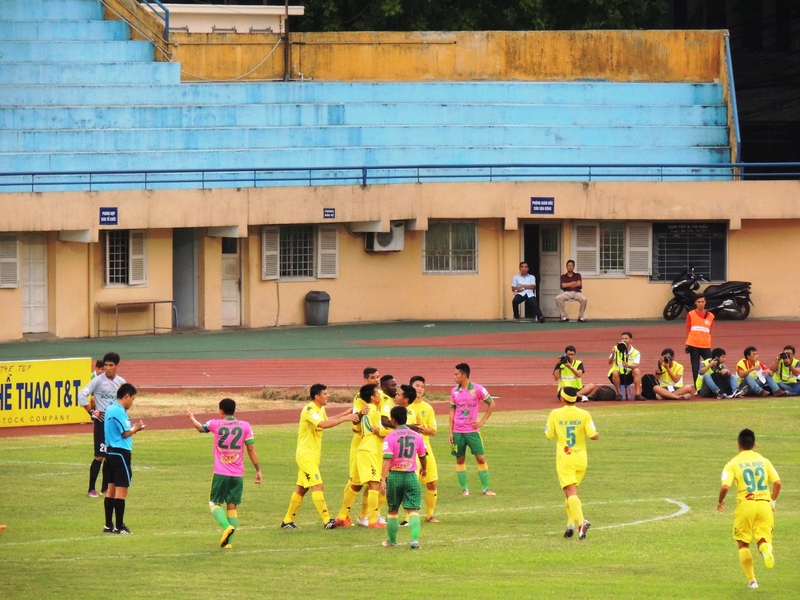 Dong Thap’s chances took a blow before the teams even kicked-off with leading scorers Kpenosen and Ajala missing, and the visitors fielded a 100% Vietnamese team, a rarity in the Vleague. The Nigerian duo have scored 17 of Dong Thap’s 24 league goals this season. Inevitably the warning signs came early for the visitors with Gonzalo and Van Quyet coming close within the first 5 minutes. It took just 7 minutes for Hanoi to break the deadlock, as Samson scrambled home for his 10th league goal of the season. Wave after wave of Hanoi attacks continued, with the visitors struggling to see the ball. Argentine Gonzalo grabbed a brace to send T&T in 3-0 at halftime. It was in fact the southerners who inflicted T&T’s last defeat at the beginning of May,but there was to be no repeat this time as the home side continued to press as the second half began. T&T ‘keeper, Duc Anh, Hanoi’s ‘man of the match’ the previous week against Danang, barely needed to stay awake. It took just 15 minutes of the half before Van Quyet scored Hanoi’s fourth. The inform national team attacker hit two more to grab his first hat-trick of the season, after Dong Thap’s Quoc Anh had comically put through his own goal. The last time T&T scored seven in a match? 4 years and one day ago versus Dong Thap, winning 7-1 at the Hang Day Stadium on 16th July 2011, with Nguyen Van Quyet grabbing a hat-trick! Such a convincing win meant T&T’s new fan group, ‘the Contras’ were in full party mood. 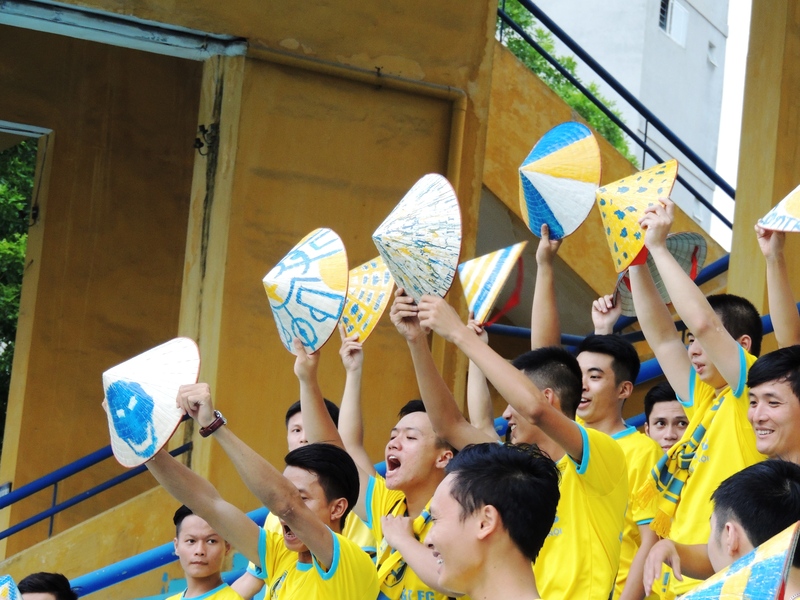 After last weeks impressive banner display (which is now a weekly feature) Pham minh Son and his team set about painting 50 conical hats in the hanoi yellow and blue. It seems the group are slowly growing. Enthusiastic drummer, Cuong, explained that ‘we’re all students, 100% university student group”. However, their enthusiasm is spreading, as another fan, also named Cuong, explained, “they’re all students, i’m not. i have job, but this is great!” as he proudly wore his Contras t-shirt and scarf. Students or not, the buzz this group is creating is infectious and hopefully more fans will continue to come. In true copycat Vietnamese style though, there is now a ‘Binh Duong Contras’ fan group. If something works, copy it! This bothered me somewhat so I’ve started to sow the seeds for the club to establish a nickname synonymous with Hanoi, something the other fans certainly won’t want to copy…..